‘Marine will be disappointed to only come away from the Raymond McEnhill stadium with a point after playing the whole second half and conceding two goals against ten men following Jack Stanley’s reckless challenge on Joe Shepherd in a chaotic few minutes as the first half drew to a close. Manager Lee Spalding made four changes from the side that drew 0-0 at AFC Dunstable in the FA Cup only 48 hours earlier, as Jack Alexander, Joe Shepherd, Dave Bampton and Ryan Campbell returned to the starting line-up in place of Dan Williamson, Luke Williams, Joe Selman and Josh Parsons. Williamson, Selman and Parsons dropped to the bench whilst Williams missed out with injury. The first chance of the game fell to the home side after ten minutes as Stanley picked up a loose ball in midfield and fired a vicious shot from fully 30 yards which Josh Hill did brilliantly to tip over the bar at full stretch. Spalding’s men then took the lead after quarter of an hour as Campbell, already giving his marker a torrid time, went down the left hand side and crossed in a delightful ball to the back post where Conor McDonagh powered home a header past the helpless goalkeeper Jake Hallett. It was a goal of such simplicity but a great goal to watch. Stuart Fleetwood sliced an effort high and wide from near the edge of the box, which came after some fantastic build-up play down the right hand side from McDonagh, Bampton and Alexander as they kept possession, moved the ball and carved out the chance between them. Supermarine had the bit between their teeth and it wouldn’t be long before they almost doubled their lead. Hopkins worked in a well-rehearsed short corner routine, received the ball back from the McDonagh at the near post and curled a delightful effort towards goal that crashed back off Hallett’s bar from the corner of the area. Shepherd was next to go close, as his far post effort from another well worked Supermarine corner was blocked as it was heading goalward. Shepherd went close again as Campbell who by this point had turned his defender inside out so many times he didn’t know what day it was, went down the left once again to cross into the box where the ball was blasted at Shepherd by a home defender but the ball just went wide of the post. The game then changed in a five minute spell either side of half-time. Salisbury created their first real chance as Dan Fitchett made a great near post run and volleyed against Hill’s post. The ball eventually rebounded out to Shepherd who went down under a very clumsy and high challenge from Stanley. Referee James immediately reached for the red card and Stanley got an early bath. It was the second time in two seasons Salisbury had a player sent off on the stroke of half time in this fixture and both can have no complaints. 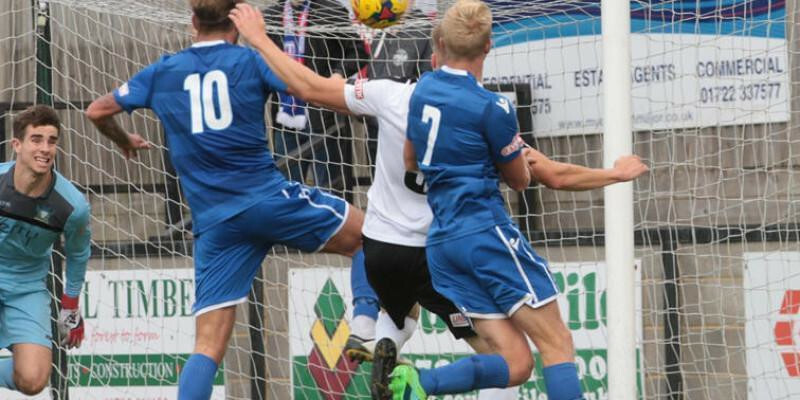 In the first additional minute of the first half, Steve Claridge’s men equalised. Luke Hopper wriggled free down the left wing and his cross was deflected up and looped over Hill where Fitchett was on hand to nod home at the back post and give Salisbury a lifeline and an undeserved equaliser. Straight from the second half kick-off Campbell again got to the by-line pulling the ball back to Brad Hooper who saw his fierce effort blocked to safety. The Whites would them find themselves with the lead with an almost carbon copy goal of their first. The ever-influential Lewis Benson was allowed too much space in the box and his looped cross was headed in at the far post by Dan Young. In a game dominated by the away side, the home side lead 2-1. Alexander went into the book for a foul and the home crowd were vociferous and baying for blood with every ‘Marine tackle or challenge. Eight minutes into the second half, McDonagh was on hand to level the game up. Campbell and Hopkins combined well down the left before McDonagh bundled home Hopkins’ cross at the far post. At this point it looked like it was just a matter of time before ‘Marine grabbed a third, but Salisbury dominated them and possession for large parts of the second half, with Spalding’s men resorting to a more direct style of football to relieve the pressure being put on them by the ten men. Two of the most influential players of last season’s promotion campaign Parsons and Selman came on, but couldn’t influence the game late on as both teams settled for a point as the game petered out with few chances being created in the final twenty minutes. It was a great effort by ‘Marine who can take heart at going to such a hard place to play and come away with a point with special mentions going to Ryan Campbell, Joe Shepherd and Jack Alexander who all made their first starts of the season and didn’t put a foot wrong which will give Spalding even more selection headaches as we head into a busy September of League and Cup action where the whole squad will need to be utilized and remain patient for their chance.